ProcurePort is a cloud hosted purchasing system that offers enterprises a single and secure platform from which to control spend operations. 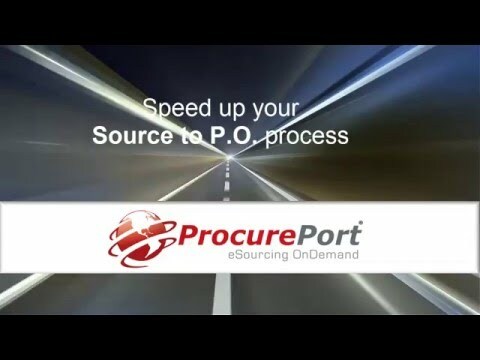 Incorporating invoicing, sourcing and budgeting modules as well as expense and contract compliance functionality, ProcurePort aims to provide users with a comprehensive procure-to-pay solution. Designed to automate the entire procure-to-pay process, ProcurePort presents users with an effective and efficient purchasing application. From the central ProcurePort platform, users can manage requisitions, approvals and quote requests easily. Users can also generate purchase orders, handle invoice reconciliations and conduct payment processing securely. Moreover, as a cloud-based software, ProcurePort affords users the flexibility to access spend information quickly from any web-enabled device. With an online vendor catalog, users can onboard and manage vendor details conveniently. By including contracted pricing in the vendor catalog, users can track budgets simply and accurately. To further enhance spend visibility, ProcurePort equips users with powerful analytics technology. Using ProcurePort’s analytics, users can gain valuable real time insight into spend performance. Besides analytics, ProcurePort facilitates contract compliance to ensure strict adherence to budgets. I did not rate 5 stars on the "Ease of Use" and "Features and Functionality" because I have used other tools in the past (Emptoris and Ariba), and compared to other tools, some of the features are missing. For example, it would be nice to have a "base cost" in addition to the "Start price". Overall Ease of use is just okay. It would be nice to have a menu bar on the left side of the screen to quickly visit the section you need, etc. In terms of support from rep, I gave it a 5 stars since he was always available when we needed his help and provided excellent support.Ability to show RANK Only which is a good feature. Ability to show RANK Only which is a good feature. Doesn't tell me the # of bids that were placed by supplier. Also, it doesn't alert me that a new bid is placed. The message button is all the way at the top so I have to scroll up to use this feature and miss the auction activity. It would be nice to have all of this in one screen. Great customer focused small company. Scalable, seems flexible. Excel upload is awesome. Seems to be easy to train and support. Tons of cloud storage. Scalable, seems flexible. Excel upload is awesome. Seems to be easy to train and support. Tons of cloud storage. Contract is not part of package, will have to complete off line and up load to storage. The part about being self supported is a little scary. Super easy to understand and use. Implemented this for our inhouse RFPs and Auctions. Our portal was up within 24 hours. ProcurePort support team contacted us and provided comprehensive training on how to use the software. It was extremely easy to navigate. We ran a rather complex RFP followed by a live Reverse auction. The setup was easy and the ProcurePort Support team guided us through the various steps, since it was our first event. The vendors needed very mininmal training so was a smooth experience. Highly recommend. To receive accurate pricing information, contact ProcurePort directly. Users can automate requisition, purchase order and invoice reconciliation processes, providing users with a simple and effective purchasing software solution. ProcurePort facilitates secure data storage, allowing users to perform purchasing activities and manage purchasing data in a secure environment. Users can onboard vendor details with contracted pricing into the PorcurePort vendor catalog, enabling users to track spend budgets quickly and easily. ProcurePort includes powerful analytics technology, equipping users with the tools to gain real time visibility into spend performance. ProcurePort delivers contract compliance, ensuring users price their goods and services correctly as well as adhere strictly to budgets. Below are some frequently asked questions for ProcurePort. Q. What type of pricing plans does ProcurePort offer? Q. Who are the typical users of ProcurePort? Q. What languages does ProcurePort support? Q. Does ProcurePort support mobile devices? Q. Does ProcurePort offer an API? No, ProcurePort does not have an API available. Q. What other apps does ProcurePort integrate with? Q. What level of support does ProcurePort offer?